Dimensions 14.5"SQ x 10.5"D* for Overlock Sewing Machines: Juki, Bernina, Elna, Viking, Pfaff, Singer, Brother, Babylock, Etc. This bag was designed to stack on top of the Tutto Machine On Wheels Case securely or used individually. 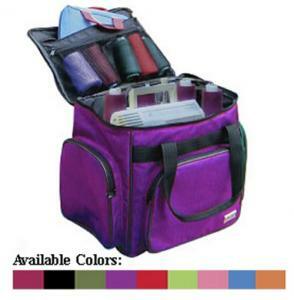 It will hold your sewing accessories or a serger and makes a great companion piece for all of your sewing travel needs. This bag features three outside pockets with zipper closures; Padded side walls and inside mesh pockets. Comes in a variety of colors and measures 14-1/2''x14-1/2''x10-1/2''. Tutto Machine On Wheels Case is sold separately. Imported. It will Stack on top ot the Large Machine On Wheels Bag. Enjoyed doing business with All Brands and will continue to do so in the future when the need arises.